The Long and Short of it All: A Dachshund Dog News Magazine: The Oldest Dachshund in the World: Meet Rocky! 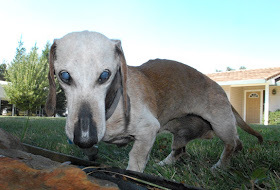 The Oldest Dachshund in the World: Meet Rocky! “C’mere, baby, c’mere Rocky — you’ve got company,” shouted Rowland, 73, who admittedly has to raise his voice to summon his pal of nearly a quarter-century. Sure enough, the coaxing brings forth Rocky, wobbling maybe a bit, but picking up speed as he headed from the bedroom of the sprawling ranch-style home and into the living room to check out the team from the Mountain Democrat. Rowland dropped to the carpeted floor where he had spread out decades worth of photos of him and Rocky, and the old dachshund made his way over to his “dad,” swiping Rowland’s bare leg with a long lick before tooling on toward the front door. A Google search shows that the oldest known dog, an Australian cattle dog named Bluey, lived to be 29 years and 160 days before dying in 1939. But among dachshunds, Rocky is at the top of the stairs as the two of that breed that made the Google list include one that lived 21 years, 114 days and another that lived 20 years, 243 days. Rowland, who was riding a bicycle up his driveway when the Democrat arrived, attributed Rocky’s longevity to being active. “He never stops moving during the day,” he said, as Rocky toodled across the lawn outside toward a clump of low bushes. “In his younger days he hopped like a bunny in the snow, and he’d get on a gopher hole and stay on it. He’d also chase cows when he was younger, and he even killed a possum once. Here's to 25 years! Read more about Rocky at the Mountain Democrat. Read about more of the oldest Dachshunds on record in the archives. Way ta go, Rocky. May you have many more birthdays! Hi sweet white face!!! cheers to you dashing Rocky!!! we think you are AMAZING!! You rock Rocky! Cheers to many more! Rocky, you are amazing! Bless ya my furend. What a wonderful dog. And so handsome! Hope you have many more happy years, Rocky. Rocky is a handsome boy. 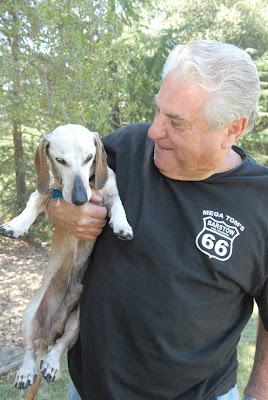 He & my little girl doxie, Slick, could have a senior doggy love affair. She is 19 or 20 years old. We adopted her in 2002 & the people we got her from thought she was either 9 or 10. She is white faced also. Doxies are special. U go rocky! I have a dachshund, gretchen who turned 18 last month....hope she follows rocky's lead! Dachshunds rock! My aunt has a dachshund he is 19 years old but sadly we have to put him down tomorrow. I hope rocky has many more years to see. I have always been fascinated by Dashunds they are so loving and caring for their owners! I have the first two still going strong at 18&17 and I couldn't be prouder of the love and protection they give over the years!! GBT!! God love his little soul!!! They are absolutely amazing animals. My dachshund, Odie, just turned 19 on March 18th. He is just like having a baby. He has brought me so much joy over all the years, I owe it to him to see him though these tough senior years!! I was looking to see if there were updates on Rocky myself.. searching the internet also. we have one that is 25 years old, she is both blind and deft, but can still get around on her on. Does anyone know if Rocky is still living? Here in the South of Africa my parents also have a cross bred dachshund going on 20, almost there. She doesn't eat much but is round like a tick, due to less activity. A bit deaf but otherwise going strong. hello all wondering if rocky is still kicking. I have a 19 year old Dachshund that still acts like he is a puppy hoping he will make 30 or more, though he is starting to get grey hair on his chin..
Aww cute keep going rocky!! !😂 you are so cute!! I have a 15 year old doxie who still acts like a puppy!!!!! His favourite thing is to take a yearly trip to the beach and dig for sand crabs! I love him to death!!!!!!!!!!! Our Abbey turned 18 on April 4th....we adore her! Is the little angel Rocky still alive? I sure hope so, that would be such an amazing news... Go Rocky - live long! My Sadie girl is 17. Ahe is a long hair. I wanted to ask, is there a “trick” to making your dog live longer? I cook meals for my dog hoping they will help. He gets chicken, carrots, and potato (sometimes sweet potato) both without skin. He’s a maltipoo. I want him to live as long as possible because he’s my only friend. Feel free to tell me some suggestions my email is timw.405@gmail.com maybe some vitamins or something I can add to his diet.